Placenta previa means part of the placenta partially or completely covers or impinges on the opening of the uterine cervix. This position makes the placenta vulnerable to bleeding, which can put mother and baby at risk and become a medical emergency. Complete: The placenta completely covers the opening of cervix. Partial: The placenta only partially covers the cervical opening. Marginal: An edge of the placenta just comes close to the opening of the cervix. These locations put the placenta in the area the baby has to move through for delivery. You already had a baby. You had placenta previa in a previous pregnancy. You previously had a cesarean section. You have a history of other uterine procedures such as fibroid surgery or a dilatation and curettage (D&C). You are pregnant with twins or other multiples. You smoke or use drugs such as cocaine. You are over 35 years old. In about one third of pregnant women, placenta previa might not cause any symptoms and only become apparent close to delivery or when labor ensues. About two-thirds of women present with abnormal bleeding, most without pain, in the second or third trimester, according to the March of Dimes. A few women might have some discomfort similar to menstrual cramps. If you notice any vaginal bleeding or contractions during pregnancy, you should contact your care provider immediately. The blood vessels in the placenta that sit over or close to the cervix can bleed easily and cause catastrophic bleeding. If you have heavy bleeding, get to the hospital immediately. 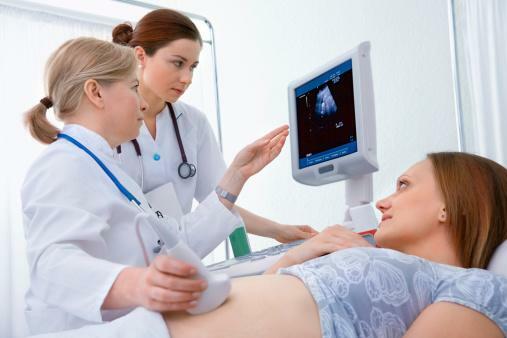 A low-lying position of the placenta in the uterus or covering the cervix might be seen on a routine early prenatal OB ultrasound. In other cases, vaginal bleeding during pregnancy usually leads to an ultrasound as part of the evaluation. This can confirm the diagnosis of a placenta previa as the cause of the bleeding. From the second trimester on, follow-up ultrasounds might show the placenta has moved away from the cervix as the uterus grows. If you have a marginal previa and little or no bleeding, you might be able to wait to have a vaginal delivery. If a complete or partial placenta previa is still present at 34 weeks and bleeding is a problem, your OB specialist might advise an early cesarean section. This is to avoid the risk of hemorrhage and its complications during labor and vaginal delivery and a stillbirth. You will be advised to have a cesarean section if there is significant bleeding at any time during your pregnancy. Placenta previa can be a major risk for mother and baby during pregnancy, labor, and delivery. It is important to follow your doctor's or midwife's management plan if you are diagnosed with this condition.